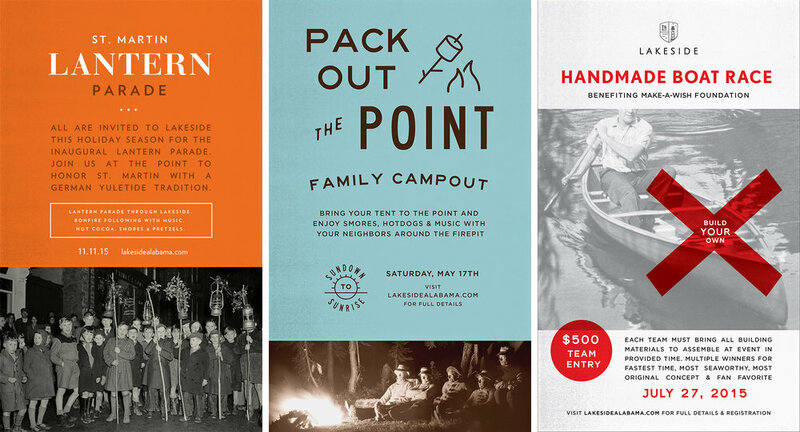 Matter created the Brand Identity for Lakeside, a New Urbanist community located on Smith Lake, north of Birmingham. This new community combines resort living with the beauty of Smith Lake, and the convenience of a central location near Nashville, Birmingham, and Huntsville. Founded in 2014, Lakeside is planned by renowned Dover Kohl & Partners and Mike Watson, with lead design by Gary Justiss Architect. Matter worked with the Lakeside founders and team to create a comprehensive Brand Identity Package, providing our client with a full design identity to initiate their real estate development launch. The Work: Matter created the Brand Identity, Print Advertisement concepts, Digital Advertising assets, Website, Merchandise, Community Event Concepts, and more.